California State University, Northridge will be celebrating its biggest welcome back to campus since its 50th anniversary Grand Reunion in 2009 when Homecoming returns to CSUN on Feb. 11, 2017. “So many of us still live close to campus,” said Shellie Hadvina, assistant vice president for alumni relations and annual giving. “We drive by the campus every day. We hear about CSUN’s elevation to heights greater than it has ever seen. But many of us haven’t taken the time to step back on campus. Now is the time to return. You can buy your tickets today on the website (www.csun.edu/homecoming). The website will be regularly updated as more details are announced. Information also will be revealed on the university’s and CSUN Alumni’s social media channels. The annual Founders’ Day Luncheon, celebrating the 50th class reunion of alumni, will be an invitation-only event and will recognize members of San Fernando Valley State College’s classes of 1966 and 1967. During the Founders’ Day luncheon, alumni and faculty celebrating their 50th-reunion year will receive a special pin from CSUN President Dianne F. Harrison to commemorate the milestone. 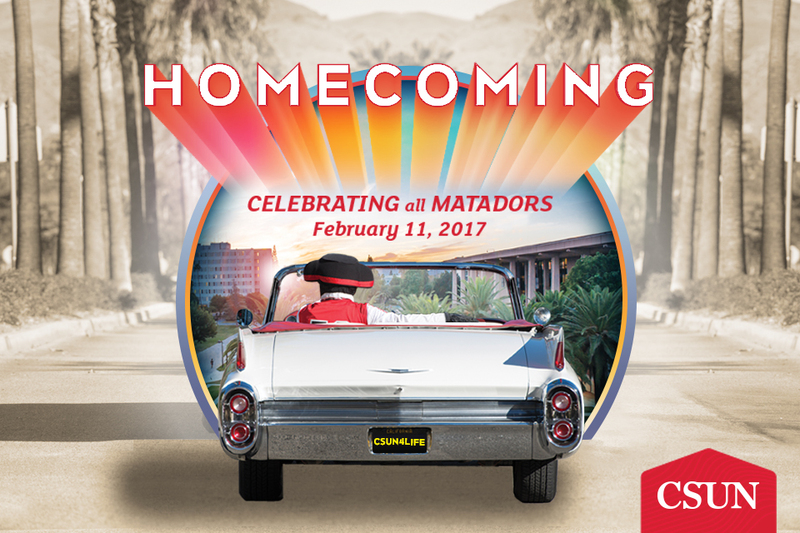 Homecoming will span several generations of Matadors, and provide an opportunity to explore the university of today and reunite with former classmates and faculty. Sponsorship and volunteer opportunities are available by contacting Samantha Delagardelle, associate director of alumni relations, at samantha.delagardelle@csun.edu or by calling (818) 677-CSUN.